Redefine Your Living Standards, and Make Life Easier with High-Class Motorized Shades! If you are looking for classy and state-of-the-art window solutions for your home in Southern California, you should check out our range of motorized shades. They are aesthetic and modern window treatments that add greater convenience to your life. You no longer have to work your shades manually since motorized shades are remote-controlled, and offer perfect convenience. Most people won’t even think about getting motorized shades for their homes because they assume they are expensive. However, that is far from the truth because we offer affordable and classy motorized shades for all types of windows in Southern California. Creative Window Coverings, Inc. has been in the industry for a long time, and has been offering high-quality motorized shades to homeowners at affordable rates. We want to help add greater convenience into the lives of people, while providing them with a stylish way to add more personality into their home. We have different motors, with separate remote control options, and you can even choose a wall mount to get more control. Our motorized shades are available in real wood, cascade, roller, roman, pleated, and cellular designs. Our motorized shades come with state-of-the-art technology. They are completely child and pet proof, since they don’t have any strings or cords in which your young ones get stuck. The best part about motorized shades is that they are remote controlled, so you don’t even have to get up from the couch to open or close them. It doesn’t matter what type of window you have installed in your home, you can get motorized shades to be the perfect window covering solution. The best thing about motorized shades is that they are remote controlled, and that allows you to have complete control over them. You can lock them in any position, with just a push of your finger, and that adds great convenience. 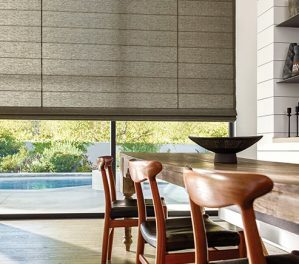 Motorized shades come with different power options to meet the unique requirements of different homes and windows. Some come with rechargeable motors, others have a DC power supply, or even a lithium battery tube that powers the motorized shades. Even your kids won’t have any trouble operating motorized shades, since all they must do is press a button on the remote. You can have them installed on any window on your home and enjoy greater convenience with motorized shades.